Tonight we get to witness not only the concluding moments of a house guest, but we also get to see two twists go up in flames. The first is not a total faildozer, thanks to the fact that production didn't entirely think things through on this one. The other is Kathy Griffin's "BB Takeover" twist, which should get plenty of air time tonight but will have zero impact on the game. More on that as it comes up in the broadcast. Instead, let's chat a bit about the first twist that will come unravelled tonight. Or at least we'll see a portion of it. I'm talking, of course, of the idiotic twins twist. You may recall from last week's reveal that all "Jiz" has to do is survive five evictions for both of them to officially play as separate players. Simple enough, right? You'd expect these dolts to just keep quiet and do nothing to bring attention to themselves. Well, they didn't, although to be fair it's not entirely their own fault . You see, these so-called identical twins are not identical at all. They sort of look alike, but there are telltale differences between the two. Differences that didn't take long for the house to notice. It didn't help that, as I predicted on the Big Brother Gossip Show, that this pair didn't have the brains to pull it off. Earlier this week, Day figured it all out. Her pal Jason then took the knowledge to various other people. They put on a "podcast" to trap them in some lies. Late last night, Julia confessed the twist to Vanessa, who rushed upstairs to tell Clay and Shelli. Today, Austin got the scoop. It seems reasonable to me that the moment they were found out the twist should have ended. Either they're both evicted, or only one could play from that moment on, especially given that Julia freely confirmed the news. The person who figured it out (Day) should have received some sort of prize. Alas, that's not the case. It appears that the two will continue to switch in and out, which makes zero sense. There are now two people playing half the game apiece with the knowledge of almost the entire house. It's just another example of how this show needs new producers. Most of this material won't be shown tonight, but commercials have teased that some of it will be aired. I'm predicting a few paragraphs early that it won't be much more than Day and Jason figuring it out. Let's proceed and find out. Julie starts off by hyping the soon-to-be failure of a "last laugh" twist. Day begins the footage by caling the house "cowards" right after the POV meeting. She knows that nobody is going to vote against Meg. Shelli heads upstairs, and with the sad piano music playing she cries in the diary room about how she just knows that Day is coming after her. "It breaks my heart that it's my hands that are sending her out the door." 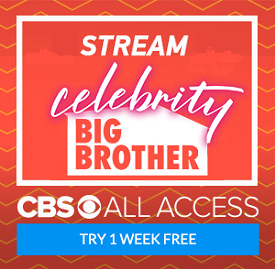 Um, this is how Big Brother works. Downstairs, Meg is talking to Jason and Day about the twist. Meg hopes it means that it saves both of them. In the diary room, Day agrees but all she really hopes for is that she is saved. "Bye, Meg. My game is me and my daughter." 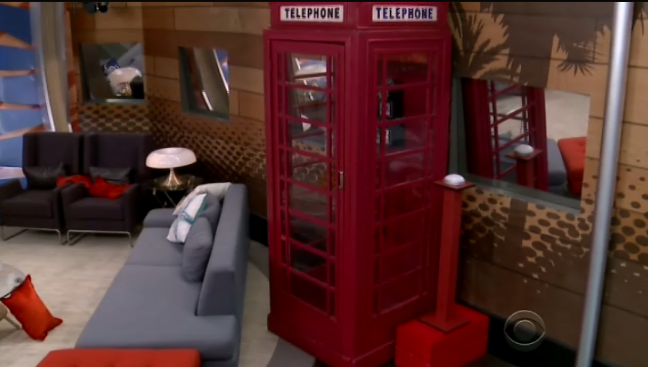 Suddenly, a telephone booth shows up in the house, followed by the "BB Takeover" theme. James makes a dumb scripted joke, and then we get Kathy Griffin explaining how the twist is going to work. They're each going to get a call, and the "right call" gets to eliminate three votes. Day and Clay both read their scripts, and the first call then comes through. No need to recap each of these, especially since I'm pissed that this material is taking the place of tons of other more meaningful material that happened this week. The only drama is that Clay really wanted number seven, as that's his lucky number. "Sorry, boo, that's my number", replies Day. Sure enough, Day won the "last laugh" twist...although, as I said, it can't really help her no matter how much they edit this. Day plays the part well for the CBS editors, though. She plays it cool in the house, and jumps for joy in the storage room. "I can't wait for eviction night. These people are going to crumble." She lets Jason know she won, and suddenly he's talking like Eminem. She needs to get five votes, and it has supposedly "lit a fire" in her. We see her approach Vanessa for her vote, and then John. They both agree, but neither really plan to help her. Audrey is then shown saying she wants to keep her. Yep, CBS viewers, you are being conned here. We also get cutesy footage of Clay whining about wanting that number. He believes she won that twist. Ho hum, especially watching Shelli try to crunch numbers. After a commercial break, we get to the twins twist. Julie Chen claims it's been a success so far, and then we see the two sharing stories. After the switch, whichever one it is heads outside in a little bikini, and the segment is like I described earlier. "It's ridiculously obvious." In the diary room, she talks about how she's been noticing how they're different at various times. Jason is a BB historian, so he knows about the previous twin twist. We then get a montage of conversation about this. "There are two of this girl", says Day, and they all rush to look at her wall photo. Watching on the HOH TV's, Clay and Shelli run downstairs to see what's up. Day then confronts whichever girl this is, and she plays dumb...which is easy for her. Day is trying to use this to get her vote, and thinks she's successful. Well, she's not, even with Liz/Julia saying she'll get her vote. A few dozen more commercials and it's eviction time. We start with Julie revealing that Becky, Jeff, and Jackie. She doesn't say that Day won. Day gets to give the first final speech, and she calls them cowards. Go, girl. "Cowards are currently controlling the house." Love it! Meg is next, and doesn't really say much of anything. Voting then starts with Jason, who (bravely) votes to evict Meg. Clay is next with a vote to evict Day, as does John. 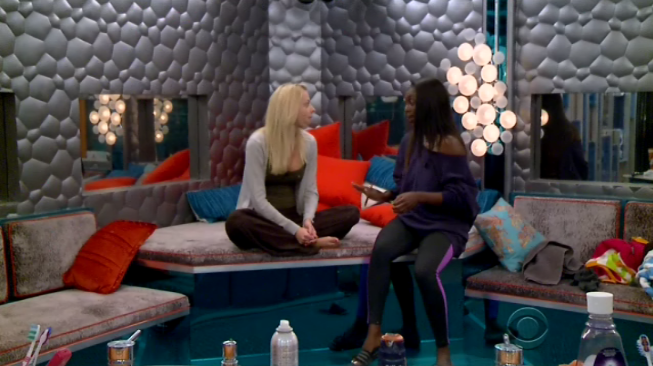 Audrey votes to evict Meg...and we head to commercials. Good job with how they lined up the first voters. When the break is over, Austin votes to evict Day, as does Julia, Vanessa, James, and Steve. I told you the twist was a farce! Day is evicted by a vote of 7-2. 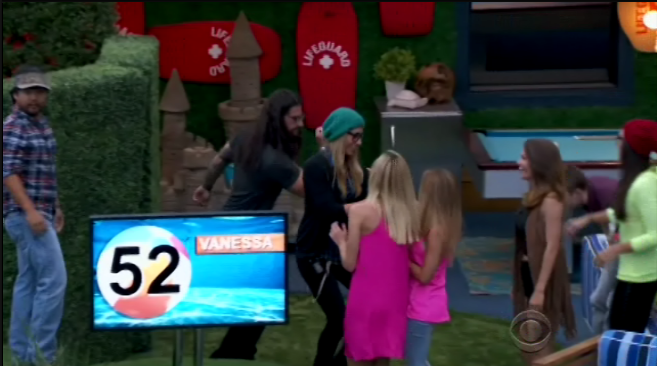 Julie announces the vote, and she only hugs Jason and Vanessa as she leaves the house. After that awkward moment where the house watches her picture lose its color (why? ), Julie starts the interview by pointing out the applause she received. Julie confirms that the twins twist was indeed true, but why did she tell others? She thought she would have scared Julia/Liz into a vote, but admits it would have been better to go to her first. She's then asked about Audrey, and Day again says that they're all cowards. "I think they're all afraid of what you guys are going to think if they nominate her, because of who she is. I had to explain to them that Audrey the person is not Audrey the player." Julie reiterates this point back to Day, who confirms "nobody wants to do it". Ultimately, Day knows that "being very vocal" cost her this game, but she wouldn't change a thing. Goodbye messages are then played from Clay (zzzz), Audrey, Jason, and the twins. Julie then tells her that Audrey indeed voted for her, and that's it for Mama Day. 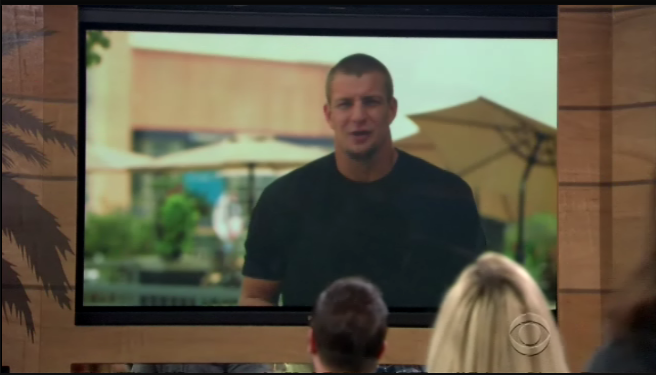 The "BB Takeover" music then starts, and Rob Gronkowski from the Patriots appears on the screen to muted response from the house. "We're going to party all week long", he said. He hates have-nots, so there won't be any have-nots (which gets a bigger screen then his introduction). He has them all go out back, and we go to commercials before the HOH competition. 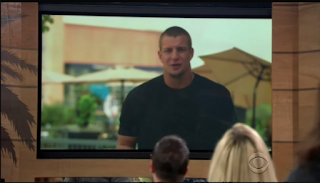 When we return, and it's a crapshoot-type game of "Gronk Pong". They have to shoot a ball towards numbered cups. 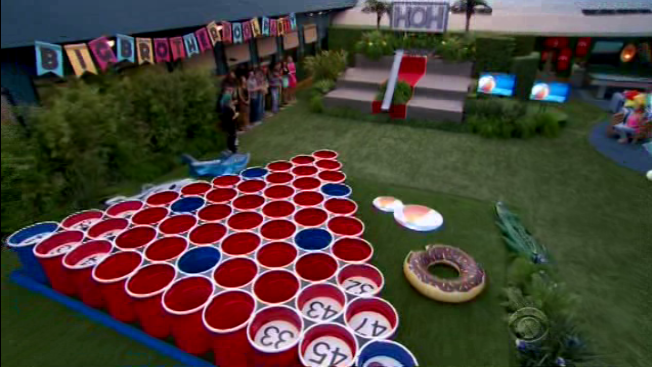 The two with the highest scores are the new HOH's. Liz goes first and gets a 23. Jackie completely misses (big shocker), as does John. James also hits the 23 cup, while Audrey gets a 17. Clay scores a 6, Jeff a 14, but Becky completely misses. Austin takes the lead by scoring a 28, and Jason also misses the cups. Meg hits the front cup, which is a one score. Steve hits the 28 cup, but it bounces out of bounds. Vanessa is the last to play, and she also gets a 23. 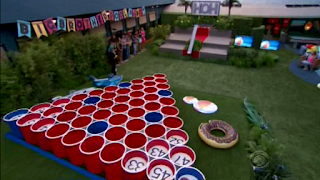 We have a three-way tie for the second HOH. For the tie-breaker, they all get one more ball. Liz goes first, and scores a 22. James gets a 35, while Vanessa hits 52!!!! Vanessa and Austin are the new HOH's! With that, the show is over. What did you think? Were the twists as big of failures as I stated? Are you happy with Austin and Vanessa as the new HOH's? How about Day's comments about Audrey? Let me know! Come on, you know you want to comment! Somewhere along the line I missed who America's player is...do you know?? There isn't one, although the entire house is convinced that Audrey is.